The full car parks in the immediate vicinity of this historic St Kilda theatre were a bucolic barometer of the power of reality TV in and beyond the big smoke. A healthy mix of Utes and pick-up trucks among sedans reduced risk of an invasion of Taliban and El Qaeda hit squads from north and west of the Yarra. Those were the good tidings - the ice and speed Tsars were blowing each other away far away as this Oklahoma oriole was showcasing her chart topping fourth album Blown Away. The bad news - how to find a safe parking spot without incurring fines from the local councillors to finance their junkets away from the Arctic winter winds. Well, an annoying ad on wireless and TV about virtues of locals in the food chain supply led me to Woolworths' car park east of Lindsay Fox owned Luna Park. It was a farm car so I adopted the rural philosophy that city slickers were never charged to park on farms so why should food suppliers pay to park in the mark-up markets car parks. I could have changed the rego to the Carbon Tax HQ but chose to emit without a permit. Now that was settled I did a soft shoe shuffle west to the Palais. A refugee from Goanna Manor - the honourable Ian Lovell (one-time manager of Shipwreck Coast chart toppers Goanna) - greeted me with an SEC smile and a pair of prime tickets. He confided he had delayed the show entree to enable a fellow Geelong fan to catch the start. The amiable south of the Murray Dixon line ambassador for promoters - Van Diemens Land born Michael Chugg and Sydney partner Rob Potts - ensured there would be no trouble with identifying the chronology of the songs performed by the headliner. Like the DJ character in the Mark Germino song Rex Bob Lowenstein the song list came in the mail - in this case a plain white envelope with titles in a font large enough to read in the soft lights. The only down side I missed the opening act - expat Irishman Damien Leith who survived the potato famine and hard times in the land of my ancestors. But, with Leith's more than adequate exposure in the mainstream, I was not going to let that spoil my trip to the seaside. It was a pleasant stroll to row O in the Orchestra stalls - especially with Texan Miranda Lambert's wedding cheating song White Liar greeting guests over the P.A. The song choice was fitting as Lambert now lives in headliner Carrie Underwood's home state with her singing spouse Blake Shelton. It should be made clear here that Carrie is wed to an expatriate ice hockey player Mike Fisher who decamped the Ottawa Senators to puck off with the Nashville Predators - not Shelton who blazed trails for our expat superstar Keith Urban on the U.S. version of The Voice. Luckily the usherette led me past rural lasses in white hats and didn't park me behind the Gina Rinehart black hat that bemused Prince Phillip on his recent trip to the colonies. The chappies with the lighting projectors ensured that Underwood's stage entrée was a bright and stark contrast to the shadowy arrival of the star's road-band. This seismic septet and female harmony singer didn't need introductions so they didn't receive one for the entire 23-song spectacular. But they ensured their idol mistress could be heard as she kick started the show with energetic latest hit Good Girl, Flat On The Floor and Wasted. Underwood appeared to be clad in funereal black, with holy stockings, as she gave new life to Two Black Cadillacs - saga of a mistress and a wife both attending the funeral of their recently deceased sperm donor. The song punchline - the cheated duo killing a third woman in the eternal triangle aka Dixie Chicks hit of the late Dennis Linde's Goodbye Earl - was a crowd pleaser for the predominantly female audience. It enabled the five-time Grammy winner to take a post coronial breather to ask fans about their collective health since her promo tour last year. Unlike the Louisiana legends Lil Band O Gold the star of this show did not suffer indignity by Sunrise host Andrew O'Keefe who asked them if they had been here before. That was just 12 months after they headed down south from the bayou for their first Australian tour. It's unlikely the late Johnny O'Keefe's nephew will get a shout at hosting the resurrection. The change of pace meant the pedal steel were audible in the entrée to So Small and the mandolin fuelled 2010 hit Temporary Home - an evocative song about adoption and foster carers. Underwood, 29, had no trouble using Last Name as a carnal conduit before the schmaltz laced Just A Dream, replete with smoke machines ensuring colour blindness was superfluous. The singer's powerful pipes enable her to reign over her wall of sound uptempo hits. But those wanting traditional country didn't have to wait too long for her folksy anecdote about meeting her idol - North Carolina born icon Randy Travis. The singer, born on a cattle farm in Checotah, gushed about her humility in calling the singing actor to let him know she stole his song I Told You So. It's unlikely Travis would have trouble with that - at the age Carrie was entering American Idol he was stealing cars before being rescued by his future and ex-wife of 30 years - Libby Hatcher. But the singer, like Travis, never lost faith - his last arrest this year was for sucking on a bottle of wine alone in his car outside a Baptist church in Dallas after celebrating the Super Bowl. Travis entered the world as Randy Traywick - and like Chad Morgan had his wick removed after meeting his ex-wife and becoming Randy Ray en route to Travis. Carrie showcased apt new banjo driven song Leave Love Alone before reaching back for assertive Cowboy Cassanova. It was a nostalgic trip for Carrie, vocally reminiscent of fellow Oklahoma singer-actor Reba McEntire as a younger woman. Maybe - without a penchant for Okie oysters. The singer borrowed from reality show mentor mate Urban as the lights went down on stage front and centre. Rural refugees and fox and rabbit hunters back in the bleachers may have reached for their guns and spotlights as dark figures scurried hither and thither in the shadows. But this was choir - not target practice - as Carrie retreated into acoustic mood with the boys in the band brandishing and swapping mandolin for banjo, dobro, fiddle and the drummer scaling down to a solitary shaker. The mood was not completely sombre for Nobody Ever Told You after she darted back into the dark for her misplaced mike for Quitter and Do You Ever Think Of Me? Underwood, like the other Prince - Charles - found time for a weather report "it's 104 degrees in Nashville but chilly down here" as she hit a Calypso note for One Way Ticket. The song, also from Blown Away, had a distinct Jimmy Buffett feel but unlike the Floridian tourist on his third visit she didn't take a dive into the mosh pit after her full band kicked it into overdrive. This was a big relief for promoters Chugg and Potts as ambulances have become ambulatory and hospitals on by-pass in recent times in a garden state rarely on the move. Not to worry - the band increased to high voltage for Undo It and a song introduced as being by an Australian band. Unlike this reviewer the crowd immediately recognised Never Tear Us Apart and had great delight in hearing every lyric of the INXS hit. There was a certain amount of Countdown style waving and dancing in the aisles and seats with no visible attempts by ushers to levy GST on use of video recorders or phone cameras. Country singers, unlike some rock peers, are generous in retaining their embryonic hits in their shows. "I would never take this song out of my set," Underwood told fans before reviving career starter Jesus, Take The Wheel. The singer proved she hadn't shed the grip of God from her Bible belt by seguing into How Great Thou Art. Fellow Oklahoma born Ray Wylie Hubbard still performs Up Against The Wall Redneck Mother and old Okie Garth Brooks revives When The Thunder Rolls on trips to Vegas. It was a fitting time to perform Cupid's Got A Shotgun - arguably her most riveting anthemic tune - that broke down moats between the artist and diarist. 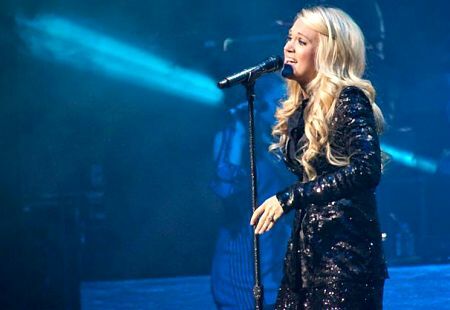 Using a Kevlar vest and Remington as metaphors for love proved her aim was true in one of her eight originals among 14 songs on a huge selling crossover country album. Her pre-emptive strike on Before He Cheats turned it into a pre-encore singalong - one again aimed squarely at vanquished victims in the middle suburbia and rural rump audience. Not much chance of an invasion by tattooed temptresses with shrapnel in ears, noses, lips and tongues on this surreal soiree by the bay. The lights went down but the twittering social media maidens knew they deserved and would receive an encore. Underwood morphed into an aural echo of recent Mississippi born tourist Faith Hill in her vocal crescendo on I Know You Won't. But it was all Carrie on the frenetic guitars and drums driven windswept domestic violence and revenge finale album title track - Blown Away. There was no doubt that Underwood had swum into the mainstream and would return down under - with or without a new album. And to ensure the vibe did not dissipate as fans made the long, slow walk to the foyer they were treated to Georgian superstar and recent tourist Alan Jackson's Good Times on the PA. It was a hard act to follow but Dixie trio Lady Antebellum and Alabama born icon Emmylou Harris return to the scene of the rhyme in September and November.